Measuring the temperature of surfaces can be difficult and at times even dangerous. Hot surfaces emanate enough heat to be dangerous in many situations and accidentally touching a hot surface can be not only painful but can even leave burns or life long scarring. Luckily, modern technology has introduced a new accurate and safe way to measure the temperature of any surface. 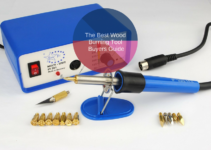 Laser temperature guns allow you to measure temperatures from afar, but there are several things to take into consideration when choosing the best laser temperature gun for your purposes. The first thing to consider is what kinds of things you’ll be trying to measure and what temperature ranges the things you are trying to measure tend to reach. Something that reaches very high temperatures will obviously need a different measuring device than something that runs at very low temperatures. 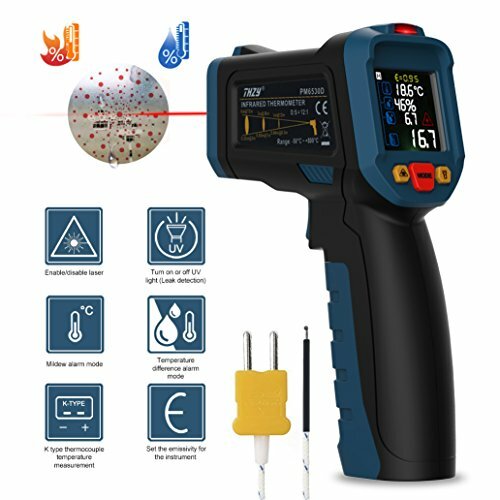 Depending on what you are trying to measure and why it may be useful to look for a laser temperature gun that features other sensors as well. Some temperature guns for example also have the ability to measure whether a wire is live or not and can even give the user a general idea of how much wattage is going through the wire. The distance to spot ration is how big of an area the laser will be measured relative to how far from the object being measured the temperature gun is. 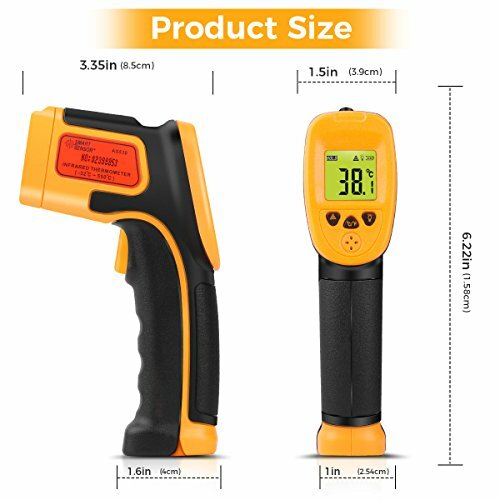 Most temperature guns on the market today have a distance to spot ratio of 12 to 1 which means that at a foot away the gun will be measuring a one-inch area. Smaller areas allow for more accurate measurements to be taken from further away. The need for this will also be affected by the size of the object you’re trying to measure. First up in our temperature gun roundup is the Etekcity Lasergrip 774. The 774 is something of an entry-level model with a decent temperature range of -58 to 716 degrees Fahrenheit or about -50 to 380 degrees Celsius. The back of the unit features an LCD display that has a bright blue backlight which automatically turns itself off to save battery. Below the screen are three buttons which control whether the temperature is displayed in metric or imperial units and can turn the backlight or aiming laser on and off. The front of the grip of the temperature gun has a simple trigger and also hold the battery compartment which contains the 9V cell that powers the device. 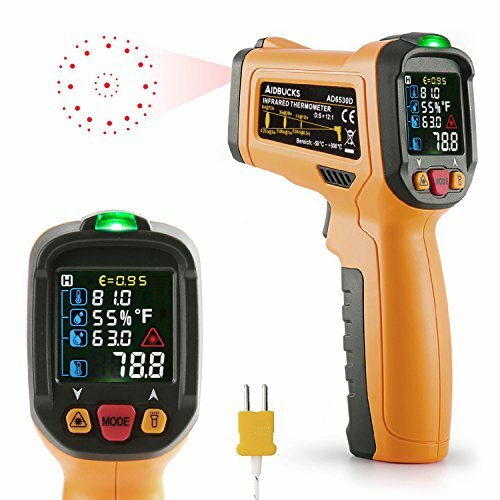 The Surpeer IR5D has a wider temperature range than the Lasergrip 774 going from the same -58 degrees up to over 1000 degrees Fahrenheit. In addition, it also comes with more sensor options and can be configured to display the average temperature of the area it’s measuring or the minimum or maximum temperature in that area. This is indispensable when trying to get the temperature of a specific component rather than an entire area. The IR5D can also display how wide the temperature range in an area is. This model also runs on a single 9V battery and comes with a complimentary meat thermometer. This model can also be set up to trigger an alarm when a given maximum or minimum temperature is reached. 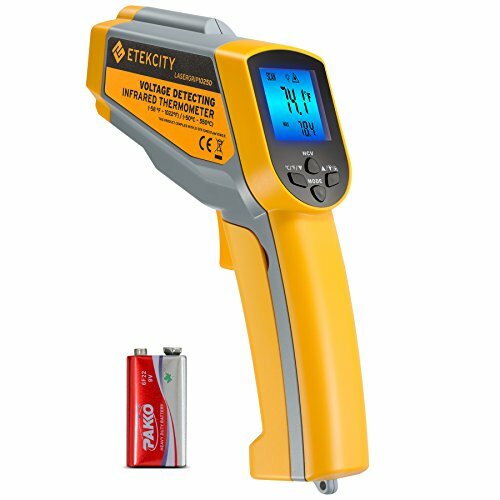 Etekcity is the largest manufacturer of laser temperature guns, and the second model from them we’re taking a look at is a slight step up from the 774 we looked at earlier. 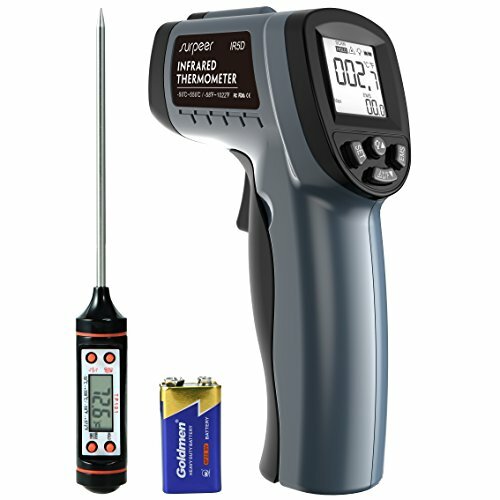 The Lasergrip 1080 has a temperature range that matches the IR5D going from -58 to 1022 degrees Fahrenheit. Much like it’s lower end brother, however, it lacks many of the features that some of the competitors have. This temperature gun is incredibly simple to operate, but might not be ideal if you plan to try and get the temperature of a very precise spot or a single component of a system rather than an area in general. 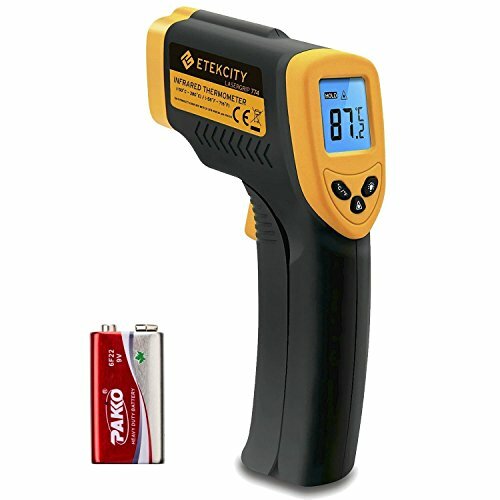 This model has the same three button configuration as the other Etekcity temperature guns with a streamlined three-button operation. Next up in our roundup is a temperature gun made by THZY that boasts a wide array of additional sensors and modes. Not only does this thermometer have an incredible range going as high as 1472 degrees, but it can also display the ambient temperature of the air around you as well as the humidity of the air. Using this information the device can then calculate the dew point of the area around you. On top of that, the front of the device has a variety of apertures that can not only point a laser to assist in accurate aiming but also has a leak detecting black light feature making this ideal for plumbers and mechanics. As we continue to work our way up the Etekcity lineup of temperature guns we begin to run into some interesting features. The 1025D shares a temperature range with the 1080 maxing out at 1022 degrees but features a dual laser design. One laser is positioned about the IR lens as with most temperature guns, but an additional laser is placed below the IR emitter giving the user a better idea of how big the area they’re measuring is. In addition the 1025D boasts a voltage detection feature that can tell you whether a wire is live and can measure voltages ranging from 90V to 600V. 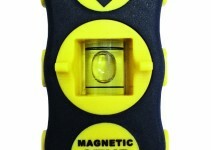 The device can be set up to emit a loud ring when voltage is detected. The Aidbucks AD6530D is similar in overall design to the THZY laser thermometer. It can measure temperatures in the range of -58 to 1472 degrees in Fahrenheit but can also be set to display in Celcius and has a variety of additional built in sensors to measure ambient temperature and humidity. In addition, this model comes with an external thermal probe that can be plugged into the side of the device. 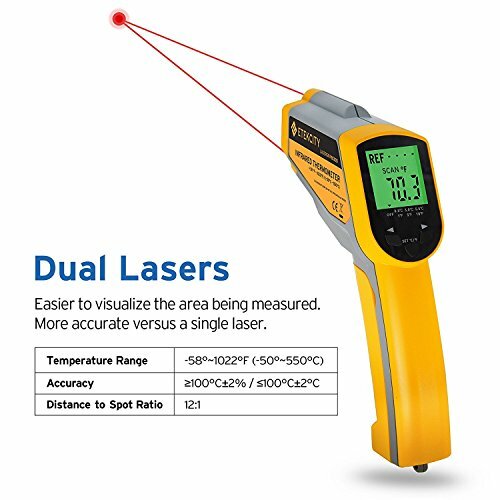 This allows the user to get more accurate temperatures in an area or spot and can also be used to measure the temperature of areas that are blocked from the direct line of sight of the laser. Moving even further up the Etekcity lineup of products we come to the 1030D. This is a model geared towards adding additional features for ease of use. 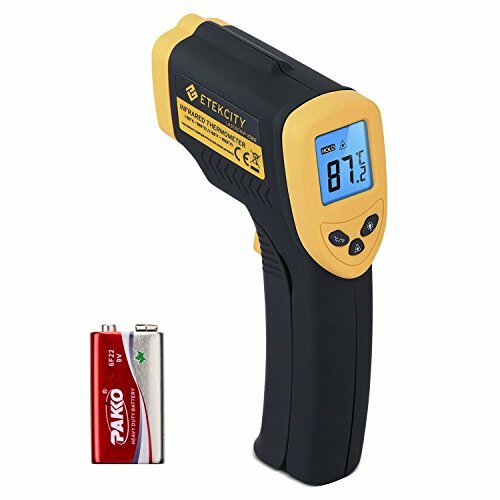 This model actually does away with the voltage detector in favor of features like a multi-colored backlight for easier reading and the ability to store and display a reference temperature. This model also has a feature called temperature filtering, which allows the user to choose incriments for the temperature of one degree, five degrees, or ten degress. This automatically rounds the results and gives the user a best estimate that accounts for the device’s margin of error. The Sovarcate IR thermometer is an ideal simple temperature measuring device. It sports a somewhat paltry range, only able to measure temperatures between -26 and 572 degrees Fahrenheit making it the smallest range in our roundup. It is, however, incredibly easy to use with a simple display that only shows the relevant information and an easy trigger pull mechanism to start measuring. This model also comes with an included meat thermometer. The unit can also read temperatures very quickly, displaying the reading within about a half of a second after the trigger is pulled. 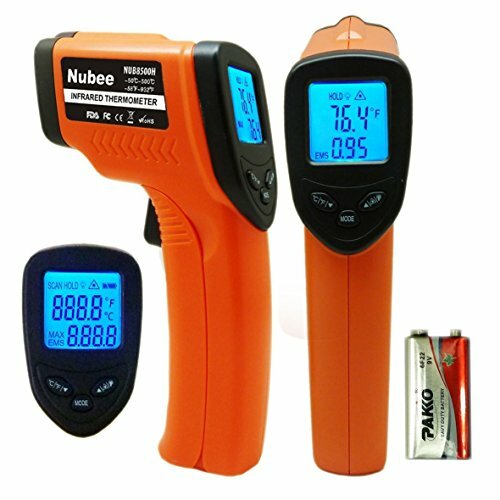 Next up is the Nubee temperature gun, which is geared towards taking very accurate measurements. This device needs to be programmed with the emissivity of the object being measures. It needs this in order to get its most accurate measurement possible. Emissivity is the measurement of how much infrared energy is reflected by an object when it’s at a certain temperature. 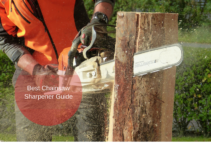 This may sound daunting but the device comes with an easy to use chart that lists the emissivity of just about any material you could want to measure ranging from aluminum to paint. It is important to use this chart however as programming the device with the wrong emissivity value can lead to inaccurate measurements. 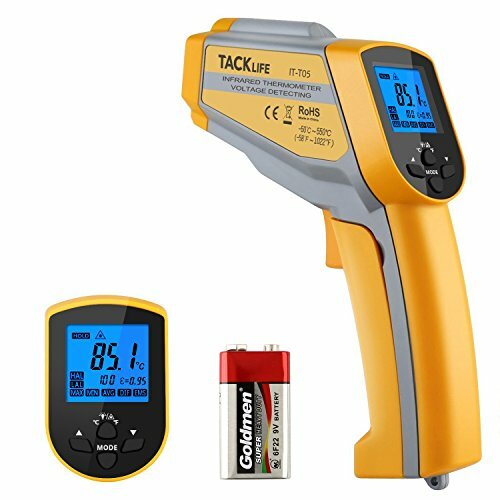 The final temperature gun in our roundup is the Tacklife IT-T05. This modelfeatures dual visible spectrum lasers for easier and more precise aiming. The unit also has the ability to set off an alarm when the temperature being measured goes above or below a certain preset threshhold. This particular model also boasts the ability to store up to 9 sets of data that can contain information regarding the average temperature of an area, the maximum temperature, minimum temperature, and the range.